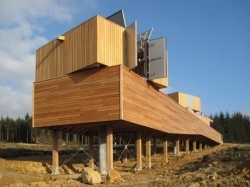 Kielder Observatory is an astronomical observatory located in Kielder Forest, Northumberland, England. 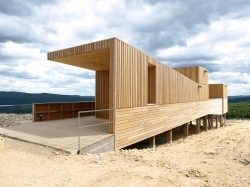 It is situated high upon Black Fell overlooking Kielder Water near the Scottish Boarder, and half a mile up a forest track from James Turrell's Kielder Skyspace. The site was chosen due to its pristine night skies in a location free of light pollution with clear views to all horizons, and is one of the best places in the UK to view the Milky Way. The observatory was officially opened on the 25 April 2008 by Sir Arnold Wolfendale 14th Astronomer Royal and in its first year entertained approximately 1200 guests with numbers growing in 2014 nearing 20,000 visitors making it one of the top tourist destinations in Northumberland. 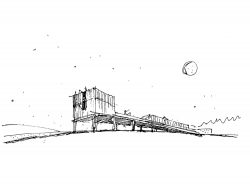 The design of the observatory is in keeping with the ethos of the forest, not only in style but also being environmentally friendly powered by solar panels and a wind turbine. This design is the result of a competition managed by RIBA competitions which was won by London based Charles Barclay Architects.It won the RIBA Award for its architecture in 2009 and also that same year a Civic Trust Award. The construction was project managed by Stephen H Mersh Building & Refurbishment Service who tendered and won the project and created an amazing award winning design.